Since its release just over a year ago, my app has been downloaded by more than 22,000 people in over 120 countries around the world. It’s been great to hear all your lovely comments and feedback, which has really helped to improve the original version. A big THANK YOU to all of you who have already upgraded to the Premium version! If you haven’t downloaded the app yet, head to iTunes or Google Play and download your free version now! If you’re not familiar with my Essential Oil Blending Tool, click here to find out more. 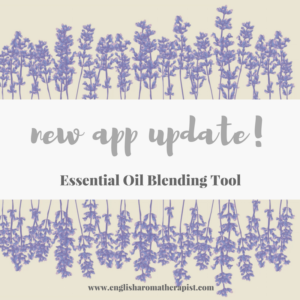 So, what’s changed in this latest version of the Essential Oil Blending Tool app? Previously, you could only access the blends you could make with your selected oils. In other words, you selected the essential oils you had (in Customise Essential Oils) and the app showed you which blends you could then make with those oils. Based on user feedback, we have changed this so Premium users can now access ALL the conditions, whether they can make these blends or not. Blends you cannot make with your oils are shown with an asterisk. Some users reported a display issue immediately after upgrading. I’m pleased to say this has now been fixed! The Essential Oil Blending Tool is all about learning which oils combine well together, allowing you to create your own aromatherapy blends. We’ll continue to tweak and improve the app over time, so feel free to send feedback or comments about your user experience!